Rollin Geppert authors a new and exciting eBook describing 44 prime locations from which to photograph Mt. Rainier. Look for it online (Amazon, Barnes & Noble, Apple and Sony) after Dec. 1, 2011. 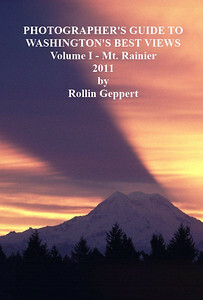 Rollin Geppert authors a new and exciting eBook describing 44 prime locations from which to photograph Mt. Rainier. Available online through Amazon, Barnes & Noble, Apple and Sony after Dec. 1, 2011. When the sun rises behind Mt. 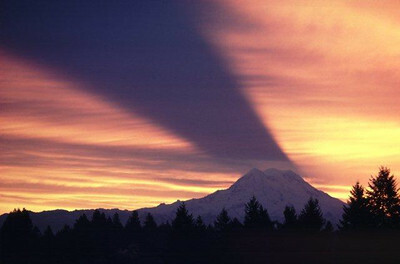 Rainier, the shadow of the mountain is sometimes projected on the high clouds above. This phenomenon is very rare and when it occurs it is far more important to be “out there” than it is to be in any special location.